A new paper published in Global Biogeochemical Cycles proposes large revisions to the ocean carbon cycle based upon observations and models, finding the global oceans act as a net source of CO2 to the atmosphere. 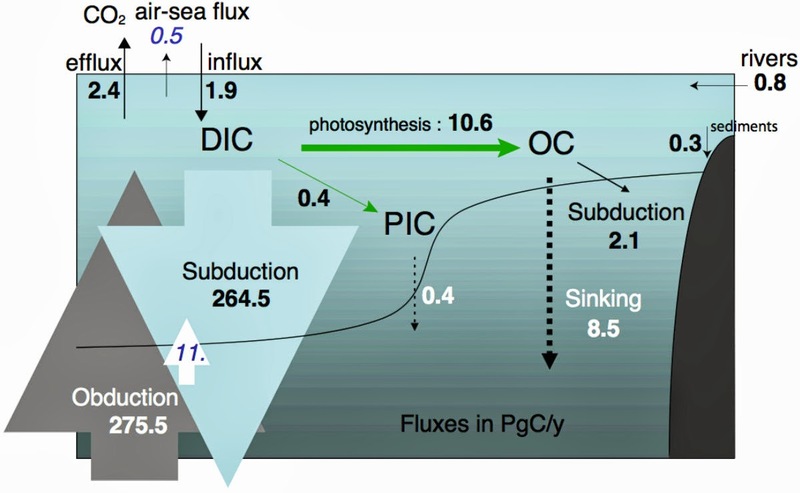 According to the authors, the flow ["flux"] of carbon from deep ocean layers ["obduction"] to the middle layer ["ML"] is 3-5 times greater than assumed previously and by the IPCC. The authors find middle-layer carbon flux toward the ocean surface exceeds flux to the ocean depths ["subduction"] by 11 Petagrams of carbon per year, which by comparison is significantly more carbon than generated by all man-made activities [8.8 Petagrams of carbon per year]. In other words, the deep oceans naturally contribute more carbon to the middle ocean layers [between 25-150 meters deep] than produced by all of man's activities combined. At the ocean surface, the authors find the oceans contribute 2.4 Petagrams of carbon per year to the atmosphere ["efflux"] and absorb 1.9 Petagrams of carbon per year from the atmosphere ["influx"], and thus, the oceans act as a net source of .5 Petagrams of carbon per year to the atmosphere. The authors find the tropical and Southern oceans act as net sources of CO2, while the temperate NH & SH and high latitude oceans act as net sinks [see figure 5 below] and "Our results emphasis the strong sensitivity of the oceanic carbon cycle to changes in mixed-layer depth, ocean currents and wind," i.e. factors not incorporated in IPCC carbon cycle models. The paper illustrates that IPCC carbon cycle assumptions may be highly erroneous by a factor of up to five times, how little is actually known with confidence about the global carbon cycle, and suggests that ocean outgassing is the primary reason for the increase of atmospheric CO2 levels, rather than mankind. The new ocean carbon-cycle budget proposed by the paper. The net source of 0.5 Petagrams CO2 per year from the ocean to the atmosphere is shown in blue at the upper left. 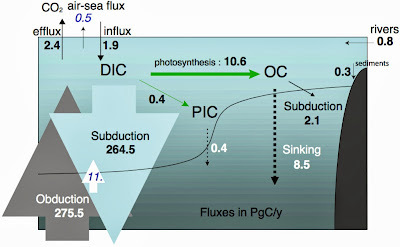 The "obduction" of carbon from the deep ocean to the middle layers exceeds flow from the middle to deep layers "subduction" by 11 Petagrams of carbon per year [shown by large arrows at left]. Note, the modelled fluxes in this illustration are from the pre-industrial period, however, due to Henry's Law, the net flux of CO2 from the ocean to atmosphere would be expected to be even higher than modelled here. Figure 6. Mixed-layer carbon budget for the global ocean in the ORCA2-PISCES pre-industrial simulation. Thickness of the arrows are proportional to the values of the fluxes. The separation between subduction and obduction of DIC and between air-sea CO2 efflux and influx is based on the sign of the annual mean flux; it reflects differences in the direction of the annual flux at the regional scale; the net flux at the global scale is indicated with oblique blue characters. DIC: dissolved inorganic carbon, OC: dissolved and particulate organic carbon, PIC: particulate inorganic carbon (CaCO3). 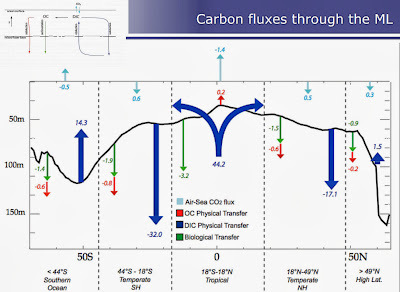 The flow of CO2 between the various oceans and the atmosphere is shown by the blue arrows at the top of this figure, e.g. the tropical oceans act as a net source of 1.4 Petagrams of carbon per year. Vertical axis shows flows at different ocean depths esp. the middle layer from ~25-150 meters deep. Figure 5. Schematic of the main carbon transfers across the mixed-layer interface, averaged by latitude bands, including the air-sea CO2 flux, the physical transfer of organic carbon (OC), the physical transfer of DIC and the biological transfer (sedimentation) in the ORCA2- PISCES pre-industrial model simulation (except for the numbers in brackets which refer to the data-estimates, when available). The surface of the arrows (length thickness) are proportional to the fluxes. The black line shows the zonal annual mean mixed-layer depth from the climatology of de Boyer Mont egut et al. . Although they are key components of the surface ocean carbon budget, physical processes inducing carbon fluxes across the mixed-layer base, i.e. subduction and obduction, have received much less attention than biological processes. 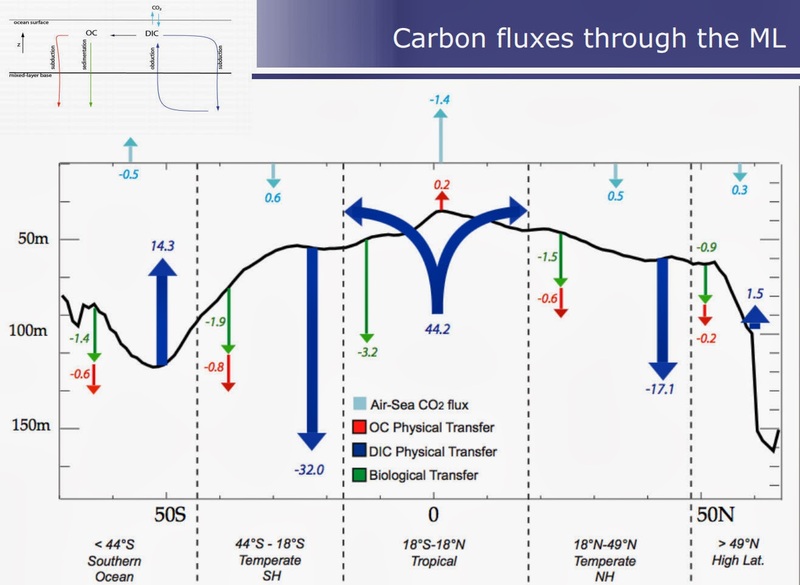 Using a global model analysis of the pre-industrial ocean, physical carbon fluxes are quantified and compared to the other carbon fluxes in and out of the surface mixed-layer, i.e. air-sea CO2 gas exchange and sedimentation of biogenic material. Model-based carbon obduction and subduction are evaluated against independent data-based estimates to the extent that was possible. We find that climatological physical fluxes of DIC are two orders of magnitude larger than the other carbon fluxes and vary over the globe at smaller spatial scale. At temperate latitudes, the subduction of DIC and to a much lesser extent (< 10 %) the sinking of particles maintain CO2 undersaturation, whereas DIC is obducted back to the surface in the tropical band (75%) and Southern Ocean (25%).At the global scale, these two large counter-balancing fluxes of DIC amount to +275.5 PgC y-1for the supply by obduction and -264.5 PgC y-1 for the removal by subduction which is ~ 3 to 5 times larger than previous estimates. Moreover, we find that subduction of organic carbon (dissolved and particulate) represents ~ 20% of the total export of organic carbon: at the global scale, we evaluate that, of the 11 PgC y–1 of organic material lost from the surface every year, 2.1 PgC y-1 are lost through subduction of organic carbon. Our results emphasis the strong sensitivity of the oceanic carbon cycle to changes in mixed-layer depth, ocean currents and wind. Thus the oceans are a net contributor of 0.5 PgC/yr as CO2 to the atmosphere. Humans contribute 8.8 PgC. Vegetation is a net absorber of ~1 PgC/yr, thus the net combination of the main sources/sinks is 8.3 PgC/yr, with humans as main cause of the increase, as oceans contribute a factor 17 less (far from dwarfing the human emissions and nature is a net absorber). The problem is that we only see a net increase of ~4 PgC/yr in the atmosphere, thus where are the other sinks? "there is always something called the mass balance, which need to be in equilibrium at all times of the day up to millennia..."
How can you possibly claim the bottom of the oceans to top of the atmosphere could ever ever possibly be in CO2 equilibrium on a daily basis at all times? BTW Bart, if you wouldn't mind sending me your email address to hockeyschtick at gmail dot com, I'd like to run some things by you in the future. Thanks & keep strong! Even if the internal fluxes in the oceans increased a tenfold, that has no effect on the atmosphere. Only the fluxes between atmosphere and ocean surface/deep oceans are important. These fluxes are very small, according to the report: 2.4 GtC/yr to the atmosphere, 1.9 GtC/yr out of the amosphere. Hard to reconcile with the 90 GtC/yr in/out from previous estimates (NASA). And hard to combine with the ~40 GtC/yr exchanges with the deep oceans necessary to reduce the 13C/12C ratio decrease from human emissions to what is measured. Last but not least, if this all is right, it blows Bart's theory out of the waters: a circulation of 1-2 GtC/yr CO2 between ocean surface and atmosphere is hardly dwarfing the 8.8 GtC/yr human emissions (neither does 90 GtC/yr). "Last but not least, if this all is right, it blows Bart's theory out of the waters"
It blows Ferdinand's theory out of the waters. If half the CO2 isn't going into the oceans, where is it going? Apparently, the land sinks are far more powerful than conventional wisdom assumes. Unfortunately, the entire AGW debacle shows that we have had a relapse. Too bad Feynman isn't around to offer his take on the situation. I bet he'd have some choice words. "But you forget that the increase is only until a new equilibrium is reached at 16 ppmv/K." Static analysis fallacy again. If CO2 is continuously upwelling, it is going to get continuously pumped into the atmosphere, and the rate at which it does so is going to be modulated by temperatures. Bart, you are smart enough to know that the exchange of CO2 between the atmosphere and the oceans is a dynamic equilibrium reaction. The equilibrium is influenced by temperature and concentration (at the water side), which both influence the equilibrium pCO2 and the pCO2 pressure in the atmosphere. A temperature increase of 1 K in the ocean surface increases the pCO2 of the oceans with 16 µatm. An increase of 16 ppm in the atmosphere brings the CO2 fluxes back to what they were before the increase in temperature. That is both at the upwelling as at the downwelling side. Starting at steady state or far off the equilibrium. Static or dynamic changing (as is the case today). The mass balance isn't influenced by where the natural sinks and sources are. If the oceans are a net source (which was the case pre-industrial, but not with 100 ppmv extra in the atmosphere), then vegetation must be the main sink (which I doubt, as that is calculated from the oxygen balance at not more than 1 GtC/yr). But more important, if your increased upwelling theory has any merit, then both the influx and outflux of CO2 between oceans and atmosphere should be at least two orders of magnitude higher than what is given in this report and should have been tripled in the period 1960-2010 to "dwarf" the human emissions increase in the same period. new paper on carbon cycle budget illustrates how most estimates are derived from models and the huge uncertainties. The authors claim the ocean & land sinks for CO2 have more than doubled since the 1960's - how could this be? Predictably, the authors did not consider the model of the paper in this post showing the oceans are a net source of CO2 to the atmosphere.